Home/ Concrete Technology / What are Different Tests for Concrete Quality Check? Quality tests on concrete are performed as a part of quality control of concrete structures. 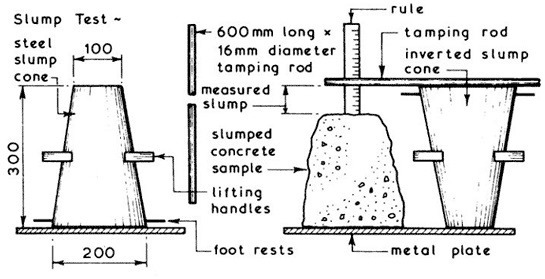 Different quality tests on concrete such as compressive strength tests, slump tests, permeability tests etc.are used to assure the quality of the concrete that is supplied for a given specification. These quality tests on concrete give an idea about the properties of concrete such as strength, durability, air content, permeability etc. Each quality test conducted on concrete determines their respective quality result of concrete. Hence, it is not possible to conduct all the test to determine the quality of concrete. We have to choose the best tests that can give good judgment of the concrete quality. The primary quality test determines the variation of the concrete specification from the required and standard concrete specification. The quality tests ensure that the best quality concrete is placed at the site so that concrete structural members of desired strength are obtained. Below mentioned are the quality tests conducted on fresh and hardened concretes. Workability of concrete mixture is measured by, Vee-bee consistometer test, Compaction factor Test, and Slump test. Air content measures the total air content in a sample of fresh concrete but does not indicate what the final in-place air content is, because a certain amount of air is lost in transportation Consolidating, placement, and finishing. The action of changing mixed cement from a fluid state to a solid state is called “Setting of Cement”. Initial Setting Time is defined as the period elapsing between the time when water is added to the cement and the time at which the needle of 1 mm square section fails to pierce the test block to a depth of about 5 mm from the bottom of the mold. Final Setting Time is defined as the period elapsing between the time when water is added to cement and the time at which the needle of 1 mm square section with 5 mm diameter attachment makes an impression on the test block. The tensile strength of concrete is one of the basic and important properties which greatly affect the extent and size of cracking in structures. Moreover, the concrete is very weak in tension due to its brittle nature. Hence. it is not expected to resist the direct tension. So, concrete develops cracks when tensile forces exceed its tensile strength. Therefore, it is necessary to determine the tensile strength of concrete to determine the load at which the concrete members may crack. Modulus of elasticity of concrete is the ratio of stress to the strain of the concrete under the application of loads. When concrete is permeable it can cause corrosion in reinforcement in presence of oxygen, moisture, CO2, SO3- and Cl– etc. This formation of rust due to corrosion becomes nearly 6 times the volume of steel oxide layer, due to which cracking develops in reinforced concrete and spalling of concrete starts. There are various in-situ test conducted on hardened concrete, both destructive and non-destructive. Some of them are concrete pull out tests, Break off tests, Schmidt Hammer test. Read More: Schmidt Hammer, Concrete pull-out, break-off, cones etc. Among the tests mentioned above, the two major tests mainly considered as quality tests are the compression tests and slump tests. If necessary, it is desired to conduct fresh concrete temperature and hardened concrete density determination tests. Most of the concrete properties are related to the compressive strength that is obtained by compressive strength test. Compressive strength test is the easiest, most economical or most accurately determinable test. The variability of concrete is best studied by means of compressive strength tests. The quality of the mix is judged by the slump test. This studies the variation of construction materials in the mix. These tests focus on the water-cement ratio of the concrete mix. The slump test is easy to conduct. It determines the quality of concrete very fastly before its placement. The placement standards are as recommended by the respective concrete practice codes. Slump test is conducted at the site which does not require any lab arrangement or expensive testing machines. Hence this test is economical. We conduct the slump test before pouring into the formwork. Hence if there is an issue with the concrete quality, the tested batch can be rejected. This would help in bringing up a defective structural member and avoiding future dismantling and repair.